Dealing with moisture quickly after a water loss is critical for ensuring that secondary damage can be prevented. 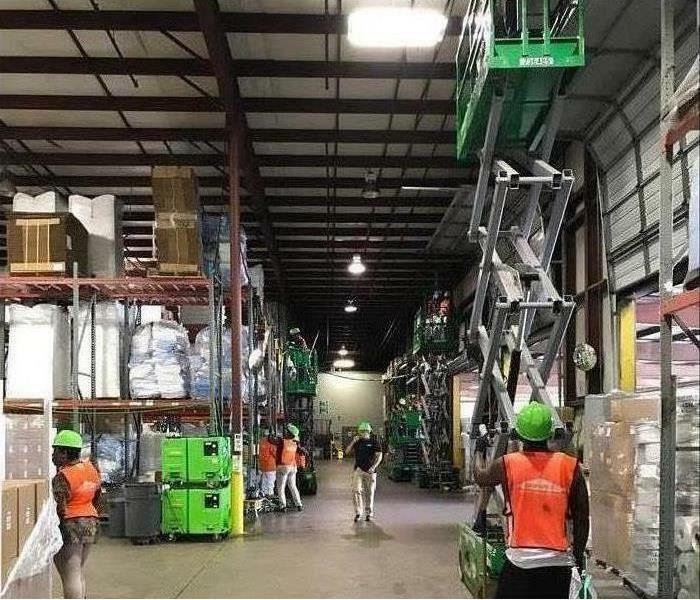 For large losses, we will often bring in desiccant dehumidifiers to help speed things up. That is what this temporary ductwork is attached to. After a large water loss left this facility in Cherokee County damaged and flooded, our team was brought in to clean up. After extracting the standing water, we set up drying equipment to help remove the remaining moisture quickly. Our team is well trained and well equipped to handle a water loss in your business, no matter how big or small. In the case of this business, it was a large job, so we brought in the large desiccant dehumidifiers. 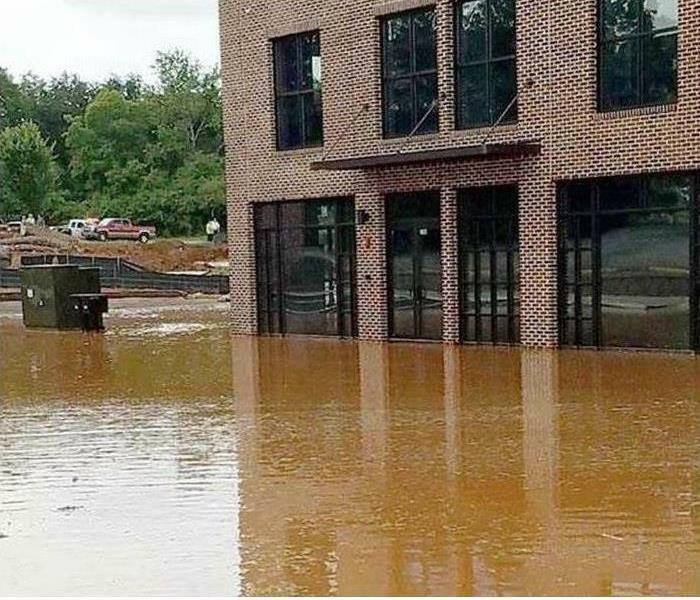 When your business suffers a large water loss, every second counts. If the water isn't taken care of quickly, you can suffer even more damage and more downtime. We are available 24 hours a day, 7 days a week to take your call. So don't wait, call SERVPRO! 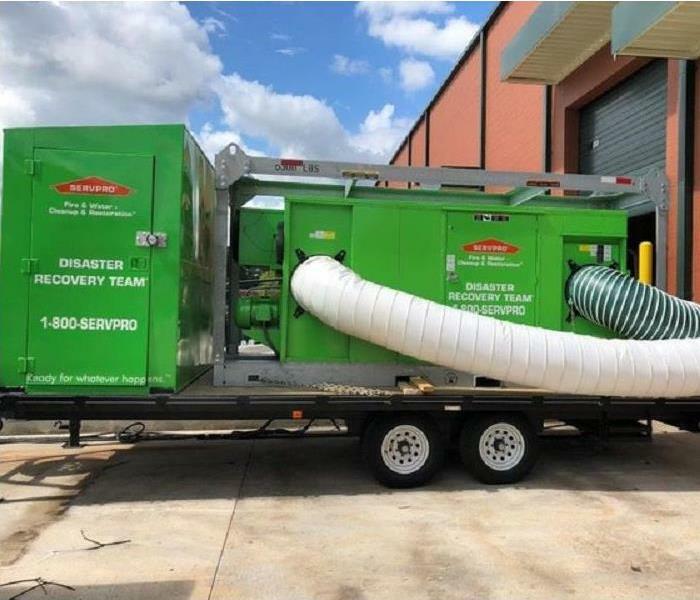 We brought in commercial drying equipment such as desiccant dehumidifiers to help dry out this facility after it was left flooded by a large water loss. If your business experiences a water loss, call us! This containment barrier was put in place after a water loss in order to prevent contaminants from migrating into uncontaminated portions of the structure. If you have a water loss in your home or business, call us! 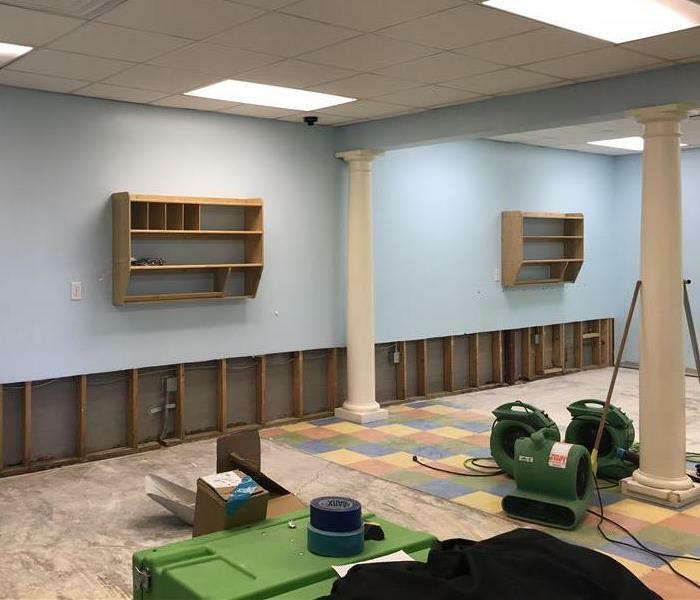 If your business suffers damage from a water loss, you need professionals that can do the job right and get you back up and running in a timely manner. 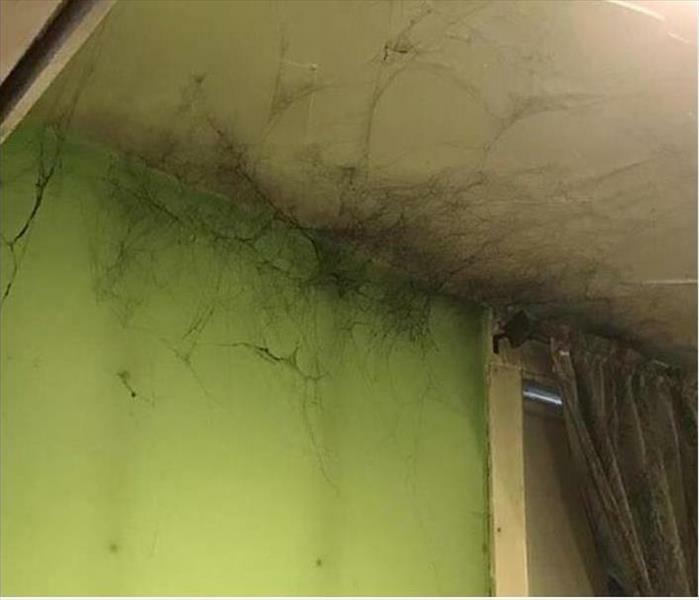 Call the pros at SERVPRO. We are faster to any size disaster. At SERVPRO, we know that time is important. However, it is not just downtime that is an issue with a water loss. Moisture must be dealt with quickly in order to prevent secondary damage such as mold in your facility. As you can see from this image, while our team was cleaning up and repairing this structure after a water loss, it was necessary to perform flood cuts in order to be able to remove damaged material. Because we know that downtime costs money, our team is dedicated to doing everything we can to keep your downtime to a minimum. If you experience a loss like the one pictured here, give us a call! 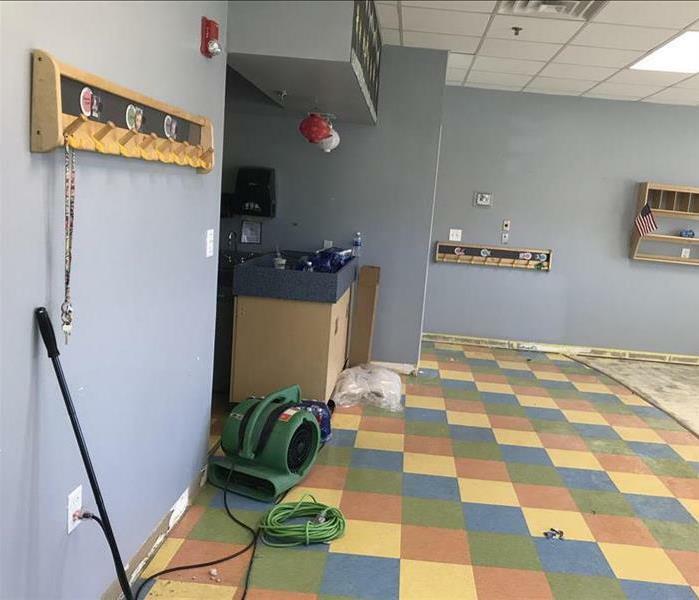 Preschool in Woodstock, GA had been flooded and needed to be cleaned. The students only needed to be out for a week before we were finished cleaning, drying, and restoring this building. Calls SERVPRO of Cherokee County if your building in flooded. Our team of dedicated professionals is highly trained and well equipped to the job correctly. Here you can see that we have placed a containment barrier while we work to restore this facility after a loss. No matter when disaster strikes, we'll be there. 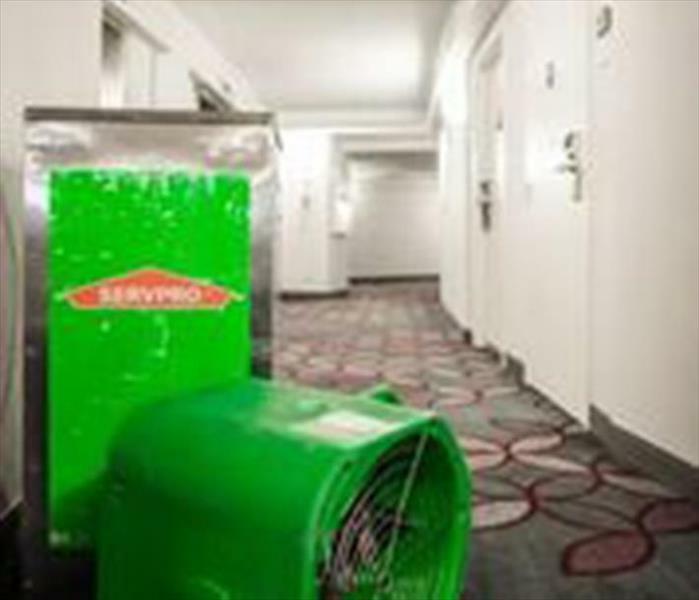 You can call SERVPRO any time day or night and we will respond to your disaster. Our team is always available and ready for whatever happens. When you have a large loss like the facility in this picture, you need a trained team of professionals that will do the job right. That is why you should call us here at SERVPRO! If your business experiences a loss, you want to make sure that the job is not only done quickly, but correctly as well. That is why we leave nothing to chance. We remove anything that could create a problem later before we begin repairing your facility. We are commercial specialists. Our technicians are highly trained and equipped to handle a loss in your business, no matter how big or small. From fire to storms, water to mold, we do it all. In your business, downtime is not something you can afford to have a lot of. That is why we are here for you any time, day or night. We are faster to any size disaster. Our disaster recovery team is available to respond any time day or night to help you. No matter if it is fire, water, storm, mold, or anything else, we are faster to any size disaster. 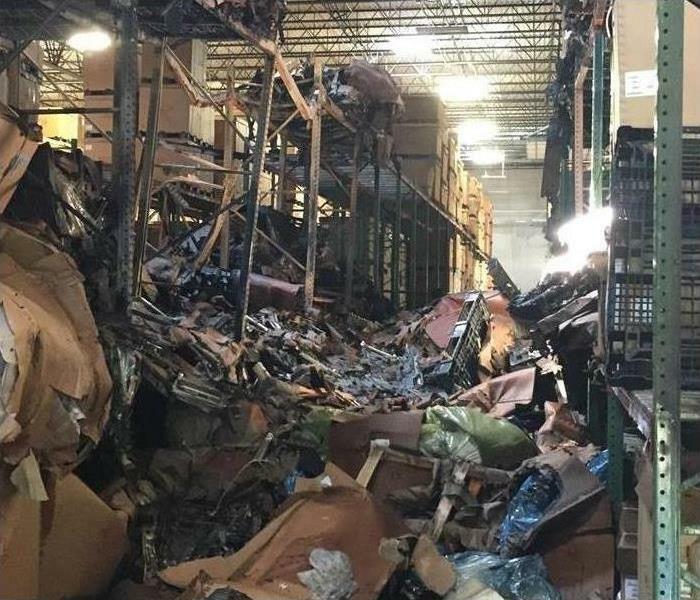 This facility in Cherokee County was damaged by a large fire and our team responded to deal with the damage. We began by removing all the soot, debris, and damaged material, and then worked to restore the facility. 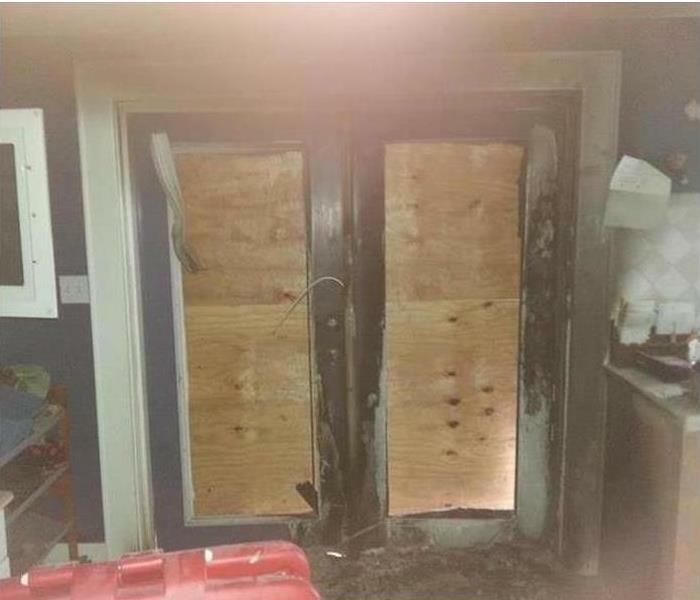 The facility pictured here had a large fire loss that left a great deal of damage, as you can see. Our team got right to work removing all the damaged material before starting the demolition and restoration process. 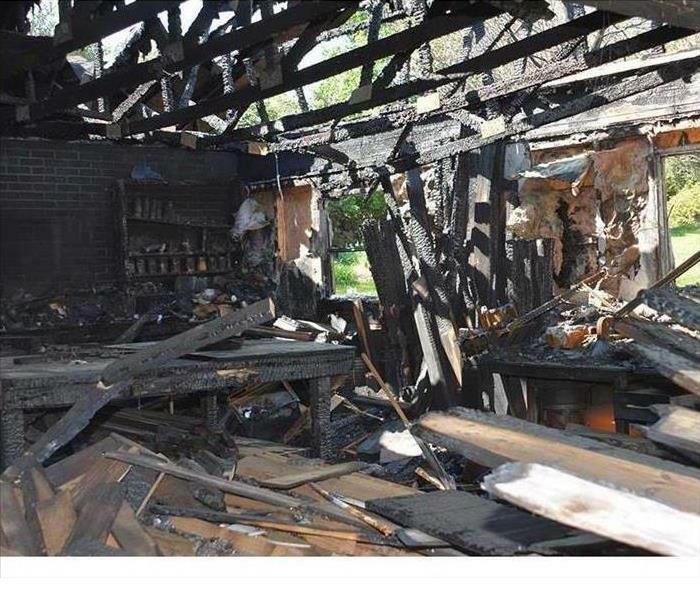 Here you can see just how much damage was caused to this home when a fire tore through it. Our team was quick to respond and just as quick to get to work repairing all the damage. In this image, you can see a facility that has been heavily damaged by fire. Our team is hard at work cleaning up and repairing the damage caused. If your home or business suffers a fire loss, we can help! We always make sure our technicians are properly equipped to handle your mold job. 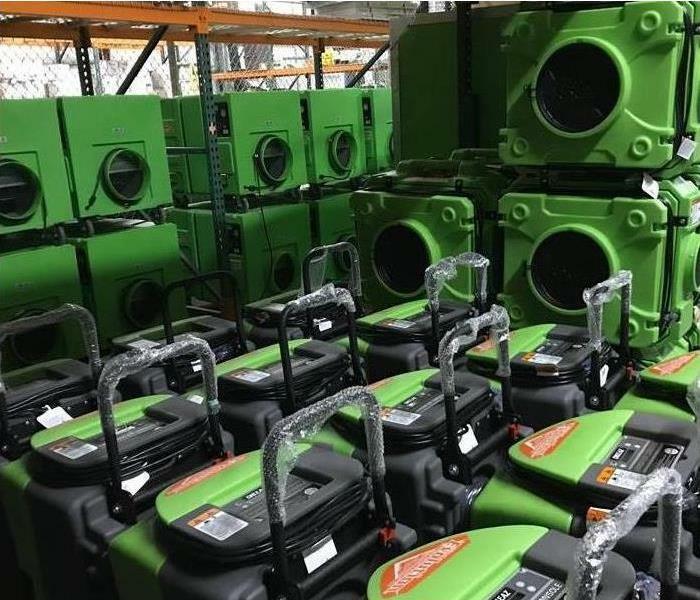 In addition to personal protective equipment, we also make sure there is plenty of equipment, such as these air scrubbers, so that we can ensure that all moisture that could cause microbial growth is removed. 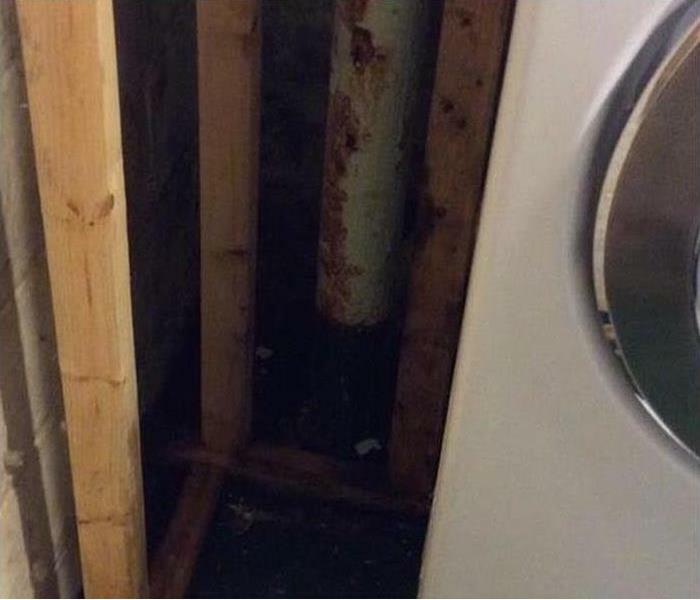 This utility closet has mold growing in it due to moisture that has accumulated here. We removed the moisture and the mold and repaired the damage it caused. 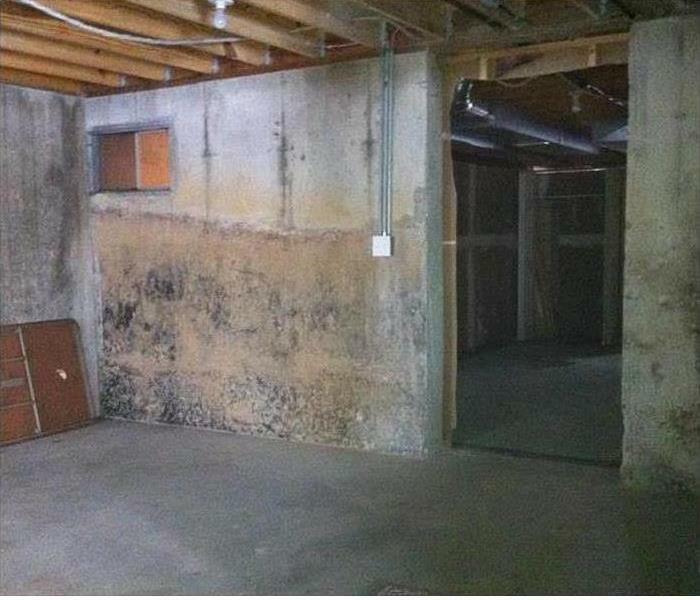 If you have a mold loss, call us! These fans are loaded up and headed to a large mold removal job. We use fans like these in conjunction with air scrubbers and dehumidifiers to make sure that we remove all moisture that could promote microbial growth. Our team found this mold while performing a wet check that revealed moisture in this wall. As you can see, we cut away the affected drywall, removed the moisture and mold, and repaired the damage. 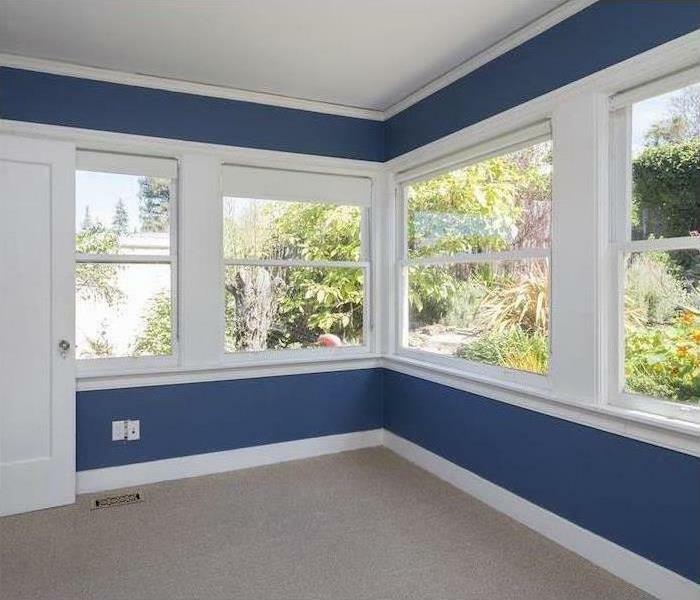 The carpet in this picture was damaged when heavy rains from a recent storm caused a water intrusion that left this room covered in water. 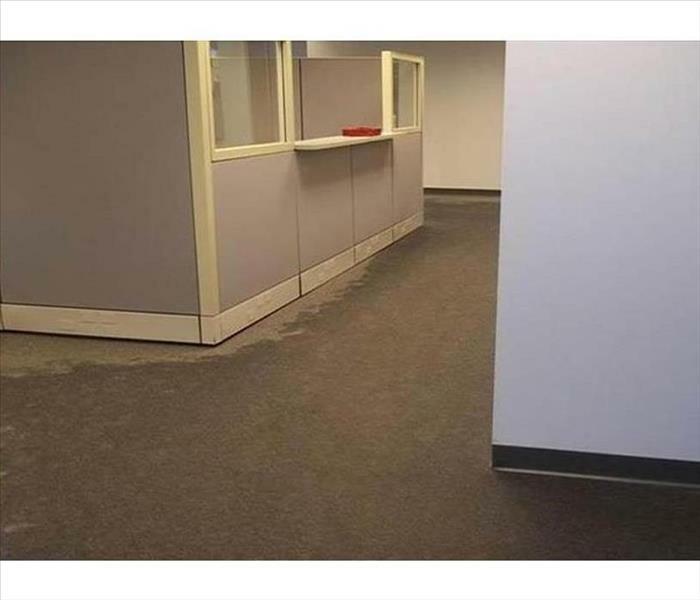 As you can see, we removed the carpet and repaired all the damage. High winds and heavy rains from severe storms recently impacted homes in our area, including the one in which this sun room is located. If your home is impacted by severe storms, we can help. When severe storms come through, they can drop large amounts of rain in short periods of time and cause flooding like you see in this image. It doesn't take long for this amount of water to accumulate. 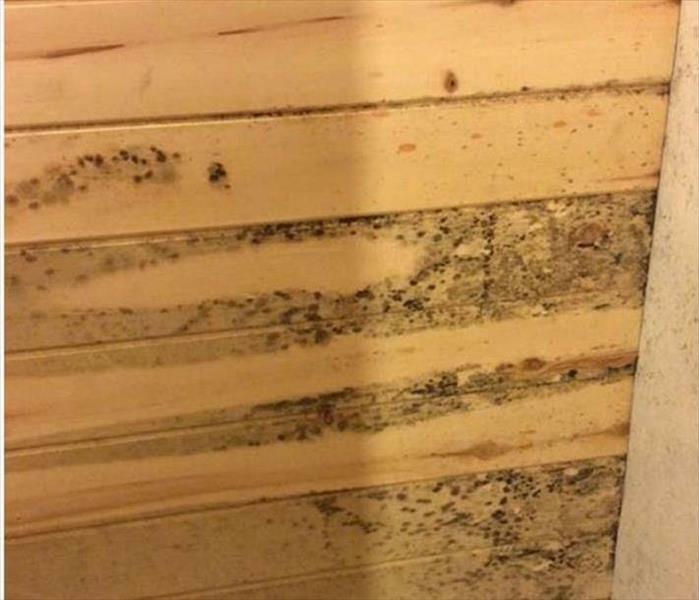 This home had a large water loss that left moisture behind and caused this mold to grow. 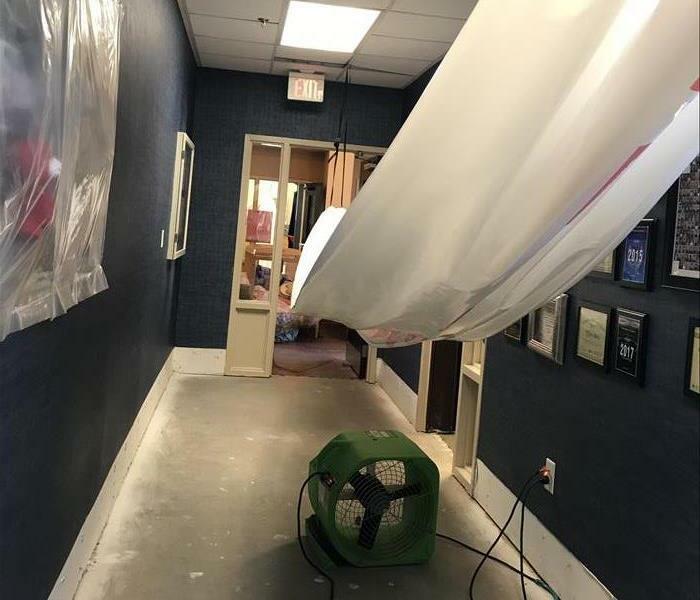 Our team brought in fans, air scrubbers, and dehumidifiers to remove the moisture and were able to also remove the mold and repair the damage. 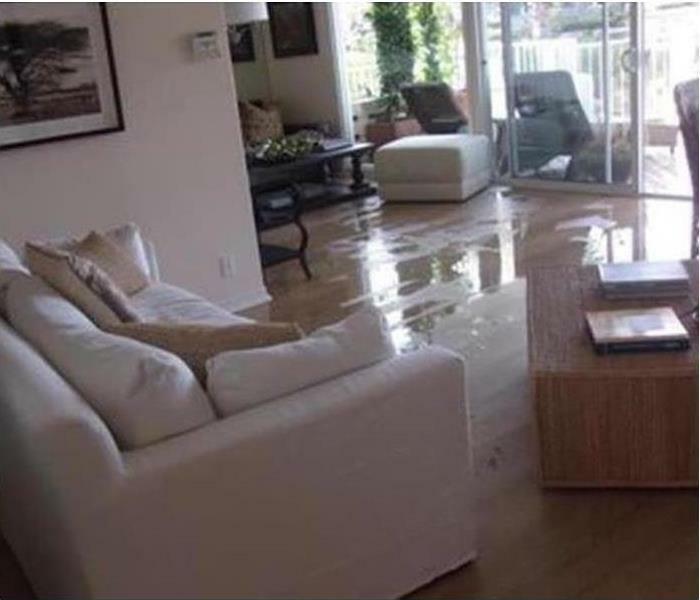 A large water loss due to a broken pipe caused this home to flood, leaving the water you see in this picture standing in the living room. We removed all the water and restored the home. 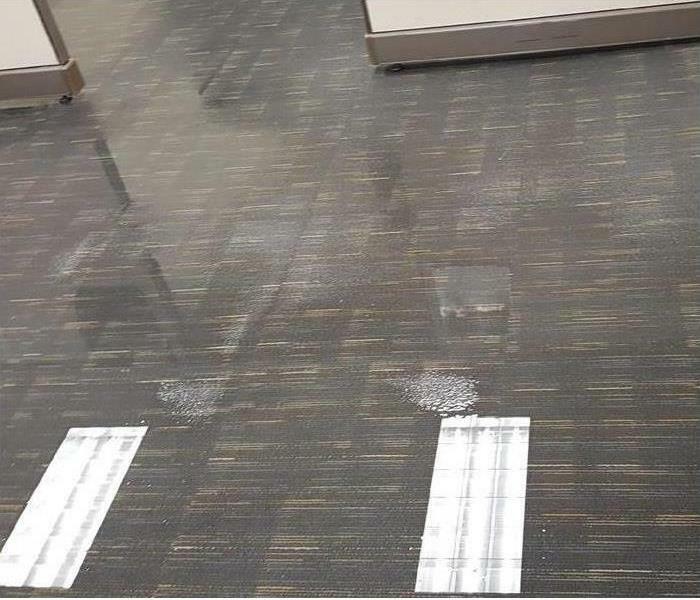 This facility had a large water loss that caused the water you see on this carpet to pool. We removed the water and repaired the damage. If your home or business experiences a water loss, call us! The walls and floors in this facility were heavily damaged when it experienced a large water loss due to a broken pipe. Our team removed all the water, then began the demolition and restoration process. Shown is the setup of evaporating devices after the water was removed from this storm damaged home in Canton. The subflooring was exposed for drying to salvage the laminated plywood. The planks were cut out a removed; some can be used when our team does the rebuild. Securing a structure in a Woodstock neighborhood is just as important as the actual cleanup and restoration of the fire damage. We strive to protect our customers' possessions along with mitigating the damages already done. There is no need for wild animals, snakes, or curious individuals to enter unwelcomed onto the premises. 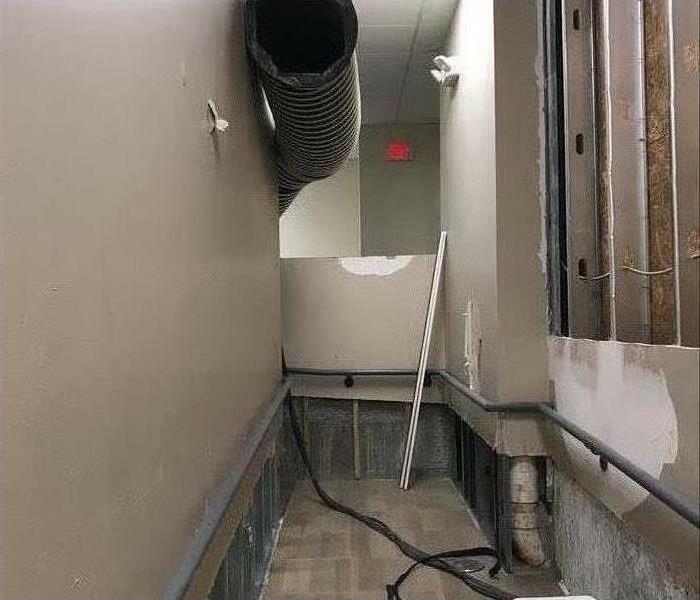 The water was suctioned out of this hallway in Canton before. 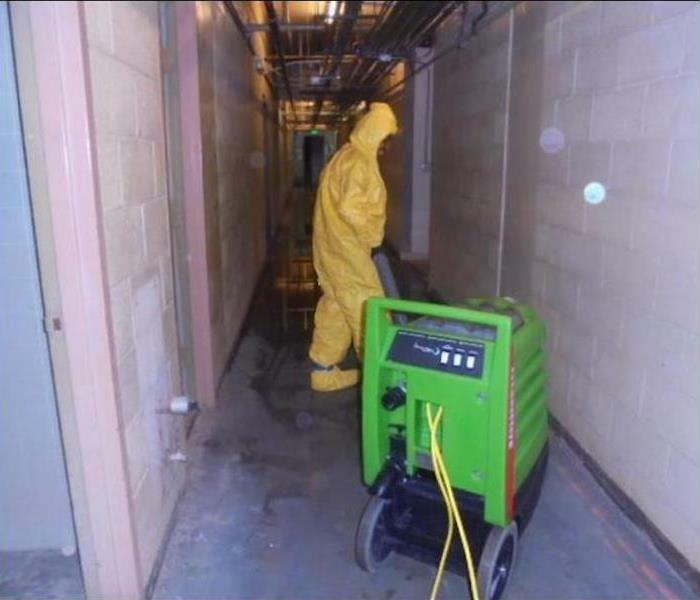 The carpet was discarded, and air movers and dehumidifiers were placed to complete the removal of water and moisture. Once the drying is documented, then the restoration of the home can begin. 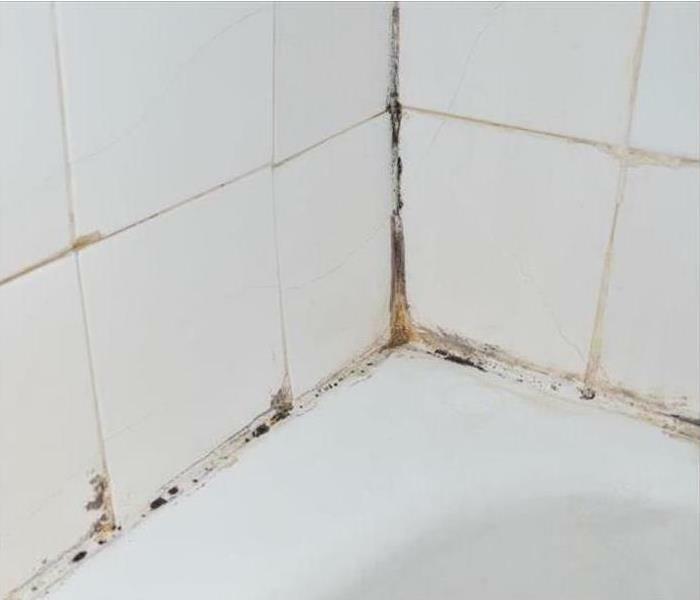 Mold damage in This Canton bathroom was able to be cleaned and treated with an antifungal agent to inhibit future mold growth. If moisture is allowed to stand on the surfaces and the ventilation system is faulty this type of mold damage can develop. It should be cleaned and treated as soon as possible. Because of the degree of difficulty of water extraction from large Cherokee commercial builds, expert knowledge and equipment are required. 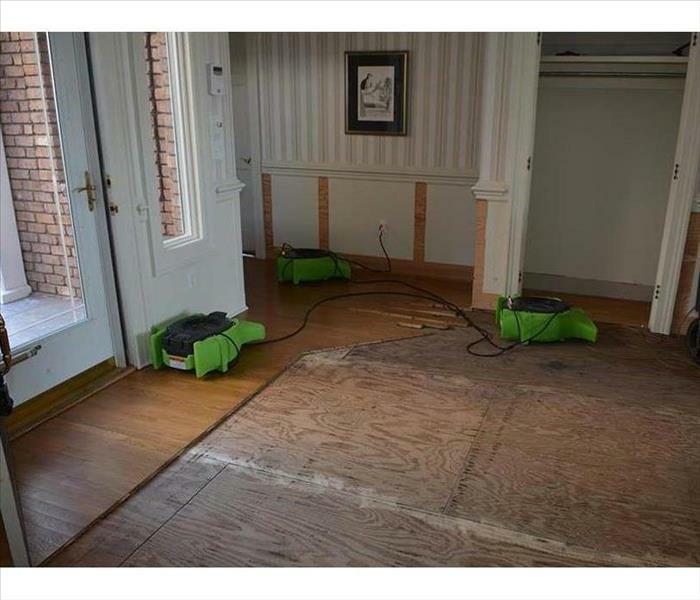 One such company that has both elements is SERVPRO of Cherokee County. By calling (770) 924-3848 day or night 24/7 a fast response to extract water from your water damaged commercial building is assured. 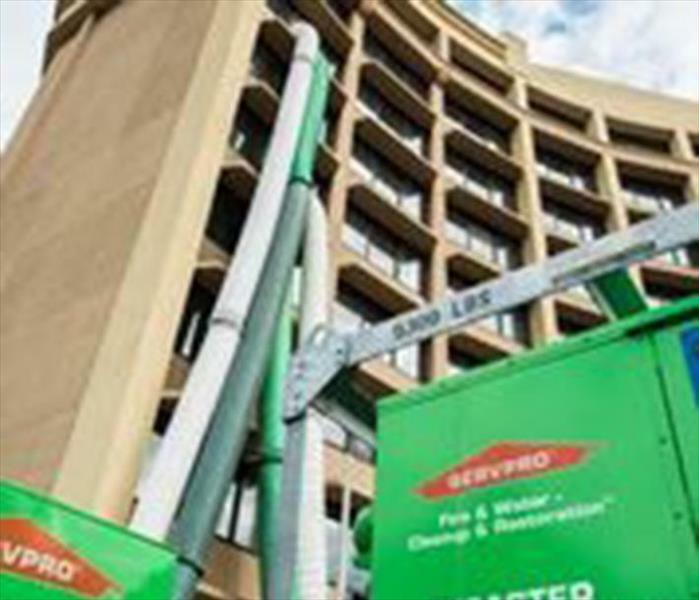 SERVPRO of Cherokee County can provide emergency services to your water damaged property in Canton. 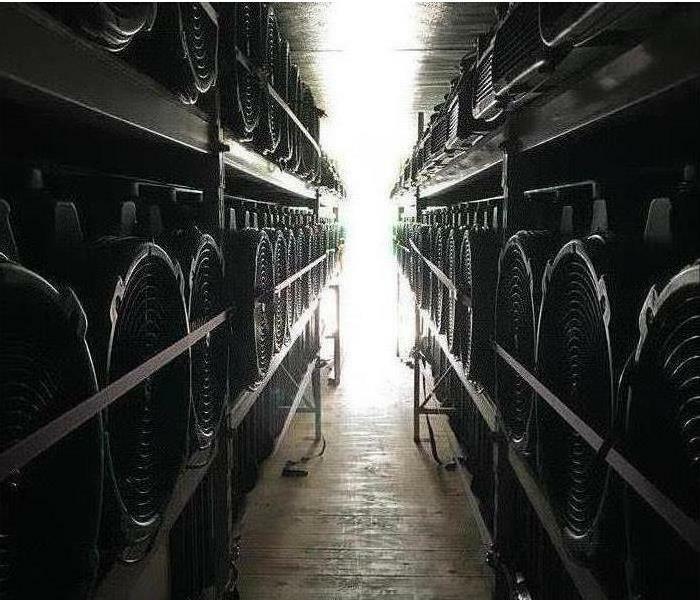 Low Grain Refrigerated (LGR) dehumidifiers and large axial fans work together to increase the rate of circulation and then capture the airborne moisture. Lowering the relative humidity RH in your commercial building also increase the indoor air quality. 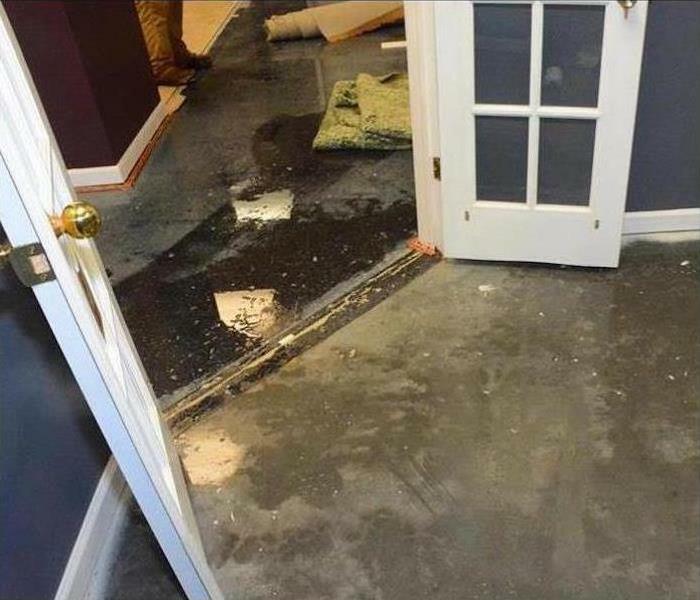 Try calling SERVPRO for total water removal and drying. Commercial water damage at this Canton facility involved sewage backup. That is why our technician is dressed in protective gear while cleaning up the sewage water. 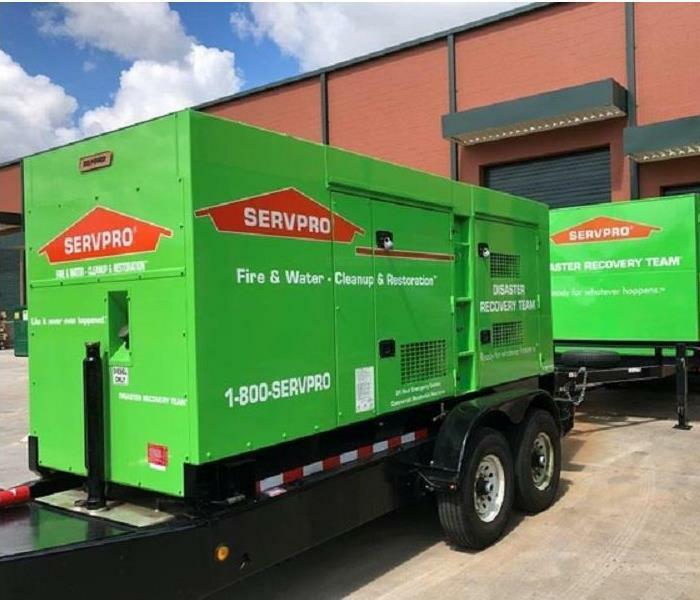 If water damage hits your commercial facility or residence, call SERVPRO of Cherokee County 24/7 at (770) 924-3848. Storm damage had severely damaged this Woodstock home blowing out the window and damaging the roof and ceiling. 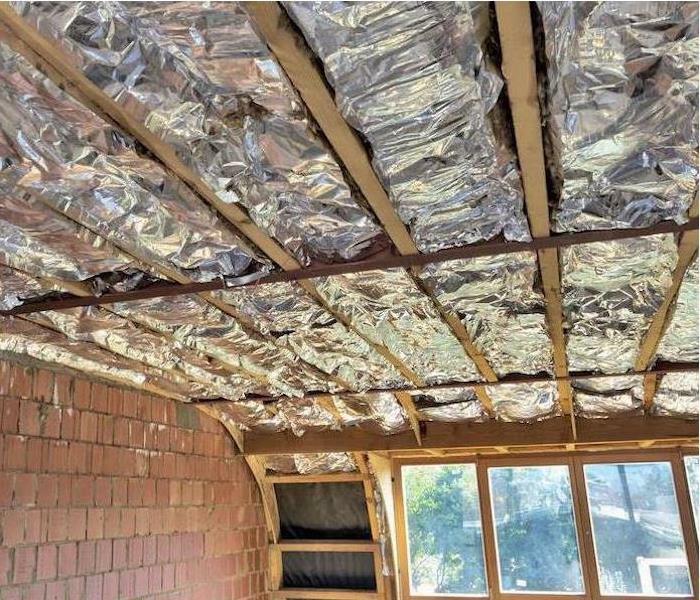 This photo shows the window replaced and the insulation installed in the ceiling. The moisture content was too high, and the dormant mold spores began developing a colony on this wall. This hard surface allowed our technician to scrape off the growth and apply a topical antifungal agent to complete the cleanup. 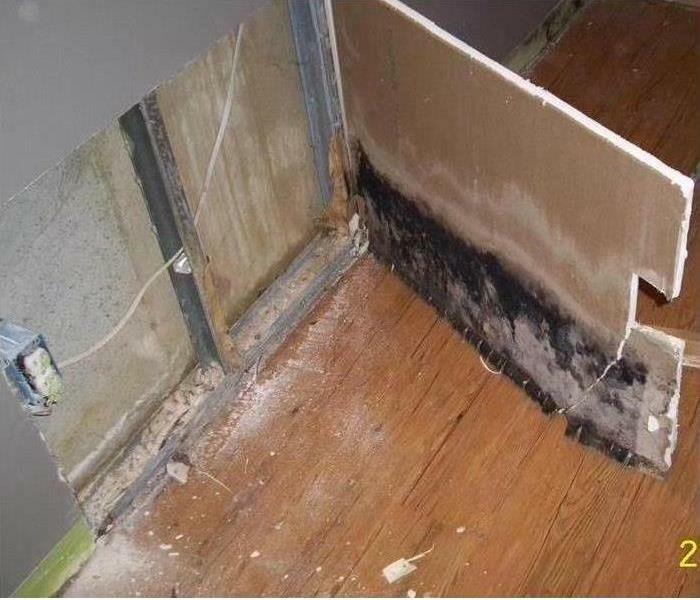 This Waleska dental office suffered a very damp carpet from a leak in the restroom. Our technician used a wet-vac to suction out the water from the fibers of the carpeting. 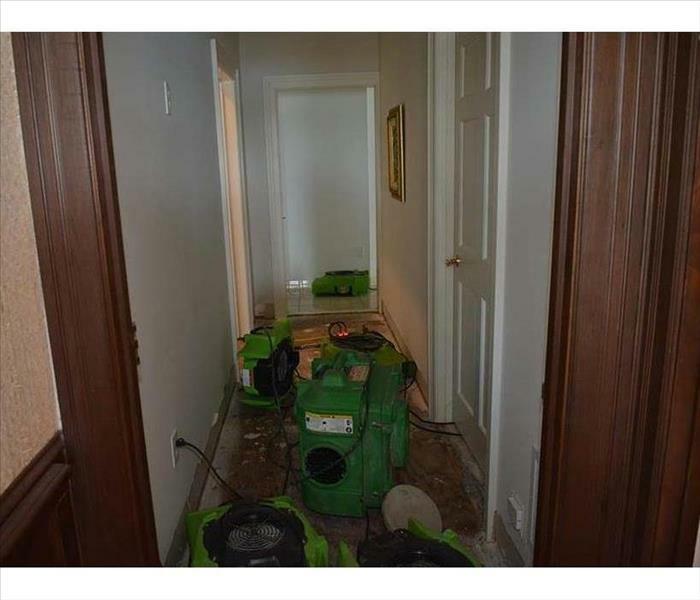 He then placed several dehumidifiers to expedite the drying process. Pictured are the "cobwebs" from a furnace blowback through the register into this room. We vacuumed up and then dry sponged the room and fogged a deodorizing product to make "Like it never even happened."